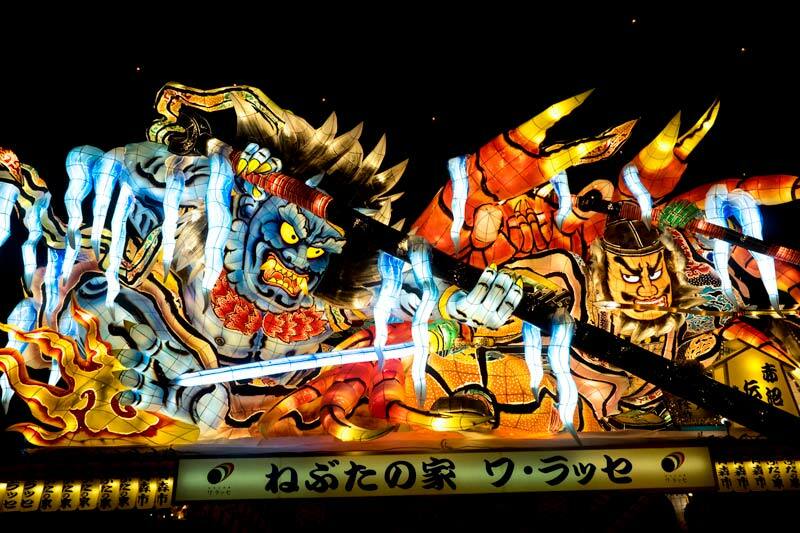 The Aomori Nebuta Matsuri is held in early August. If you can’t be in town for the festival you can still experience it at the Wa-Rasse Nebuta museum. We regularly plan our Japan trips to include community events and festivals. It’s such a fun time to be in an area and it really helps us to engage with the community, learn about local customs and see the history of the region come to life. A couple of our favourites from previous trips have been the Nagahama Hikiyama Matsuri held in early spring and the Otaru snow light path festival that takes place in winter on the northern island of Hokkaido. Smaller cities and towns like these can become super popular during festivals but we’ve always felt welcomed and able to participate in the celebrations as well as contributing a little to the local economy. 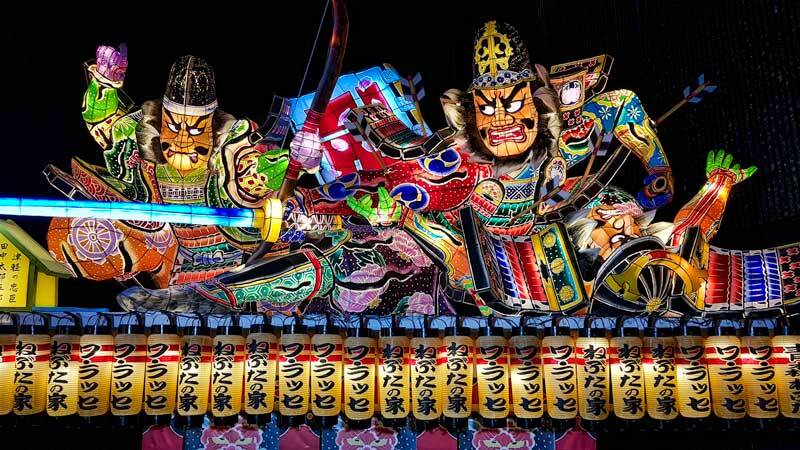 The perfect time to visit the city of Aomori at the northern tip of Japans largest island, Honshu, would be the first week of August when their Nebuta Matsuri takes place. During this time the city with a permanent population of under 300,000 swells to as many as 3,000,000 people. Matsuri is the Japanese word for a festival and you know when the matsuri is on there will be fun, laughter, colour, crowds and festival food! 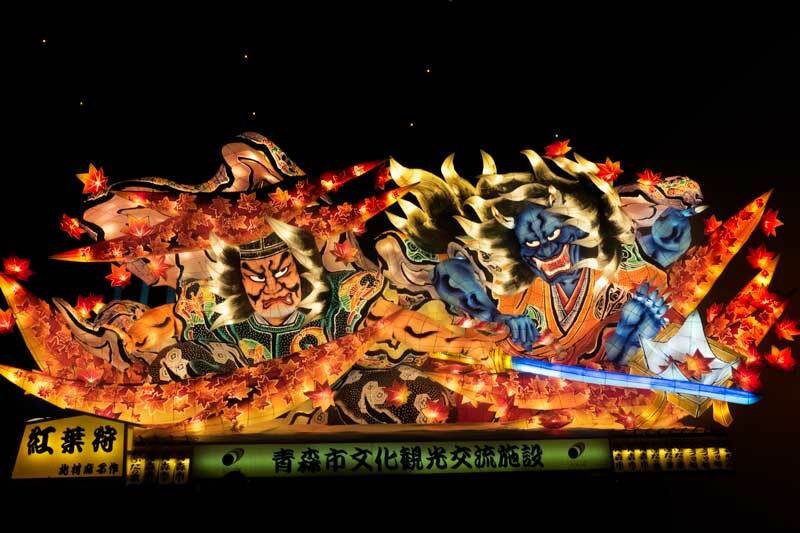 The exact origin and history of the Nebuta Matsuri are uncertain, there are a number of theories but given the specific dates that it is held, culminating on the 7th August, it is likely related to Tanabata or the star festivals held across Japan on this date. The date for Tanabata was originally the 7th day of the 7th month but that was under the Chinese calendar, when Japan adopted the Gregorian calendar it was kept on the 7th but translated to August being closer to the original date. Tanabata celebrations are well established all across Japan having been introduced by Empress Koken in 755. It celebrates a legend about the stars Vega and Altair who were lovers but were kept separated by the Milky Way except for this one day a year. During Tanabata floats are sent down a river to appease the souls of those who have passed and on the final afternoon of Nebuta the floats also make their way down to the bay where the most popular are taken onto ships to cruise the harbour. Like most traditions, it has no doubt evolved over time and merged different concepts as time passed. The custom of Nemuri Nagashi is also thought to have played a part in the Nebuta festivals origins, it’s a practice of chasing away the sleep demon who makes farm workers drowsy during busy summer harvest season, the demon is the enemy of the farm work that the region relies on. The Nebuta Matsuri has had a place in Aomori history for centuries and is believed to date back to the 1600s during the Edo period. You can imagine the effort and fire risk that would have existed in moving large paper lanterns lit by candles back then, it’s not surprising that such festivities were banned for safety reasons during some periods of its history. One thing that makes the Nebuta Festival a special one to include on your itinerary over many of other large festivals in Japan is the level of audience participation that’s invited. Even foreign tourists can take part. While you do have to rent or purchase the right costume to join in you can help either carry a float or take your place as a Haneto (dancer) and join the parade in the streets. The dance and chant are quite simple even for those of us with little rhythm and coordination, probably a safer option than carrying the float if you don’t speak enough Japanese to understand the directions being given. Renting the full attire will cost you around Y4000 (A$45) but physical participation is optional you can enjoy the parade as many others do by taking your place along the parade route to watch. If you are travelling to Aomori in August you might have a chance to catch segments of the event itself. These are the key dates to keep in mind. Arriving in Tohoku in September my timing was off by a month to attend the festival itself but thanks to the Wa-Rasse Nebuta Museum that didn’t mean I had to miss out. As a visitor with the whole country to explore, one week in August is a very specific window of time to be in a particular place, especially when so many others are planning to be there too. 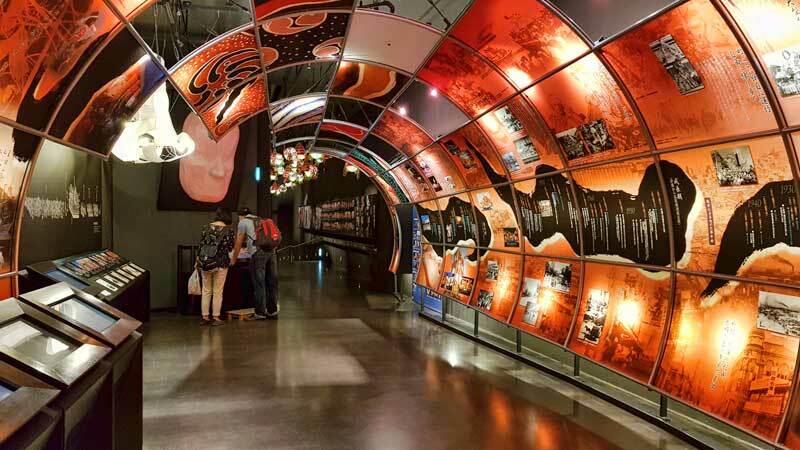 If you can’t make it for the festival week you can still see many of the floats, learn all about Nebuta and join in some of the activities during the other 51 weeks of the year at the Nebuta Wa-Rasse Museum experience. The experience centre has been set up by the city and it’s been done really well with plenty of interactive opportunities to make it fun for all ages. When you enter the very distinctive red building there is the gift shop with a big selection of Aomori specialities and souvenirs, a couple of small nebuta dolls are on display out here so you know you’re in the right place and towards the back is the Den Restaurant overlooking the bay. We had some fabulous fresh sushi here shortly after arriving in Aomori, the restaurant has a great position and view too. From here you enter through into the ticket office where there are some diorama setting the scene for how the floats are created and the parade itself. Once you have your ticket you can progress through a tunnel with photographs and information on the festival, most of the detail in this particular section is in Japanese but you’ll be given an English brochure that explains some of it. After the tunnel you can view some of the larger floats from above then move down into the main hall. This is where the fun happens. From the top I’d heard the flutes and taiko drums start up and headed down to where a small crowd started to congregate. We were led through learning the simple steps of the Haneto dance then given the opportunity to have a try at striking the taiko drum with some level of rhythm. 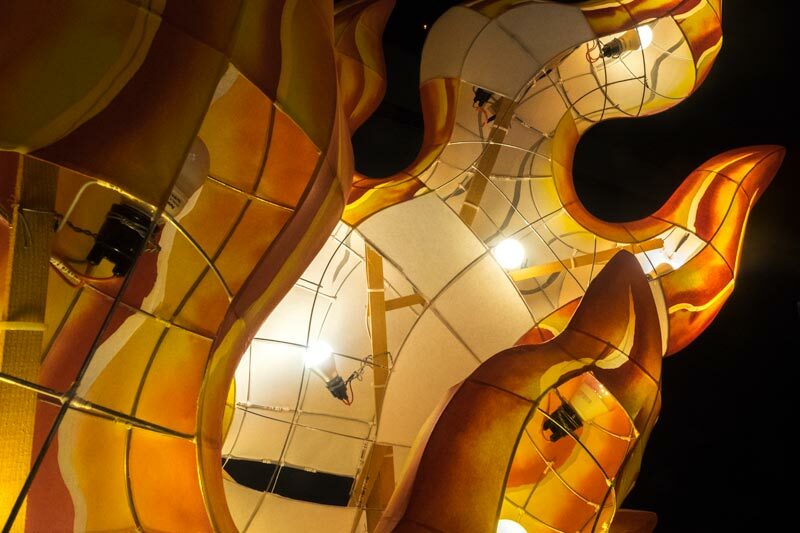 You can take your own time to wander amongst the full size floats from the previous festival and additional exhibits let you see up close how the floats are currently constructed with washi paper over a wire frame and lit by hundreds of small lights. A few of the exhibits are clearly marked letting you know that you can touch them and feel how they are constructed, even though I’m encouraged by one of the staff it still feels wrong to do it. Of the smaller scale exhibits watch out for the wall of faces ion the back wall that have been made by current Nebuta artists, in them you can see various styles and techniques that differ slightly by artist. The Wa-Rasse experience is open daily from 9 am until 6 pm, entry tickets are Y600. The official site has further information on closing days and seasonal hours. 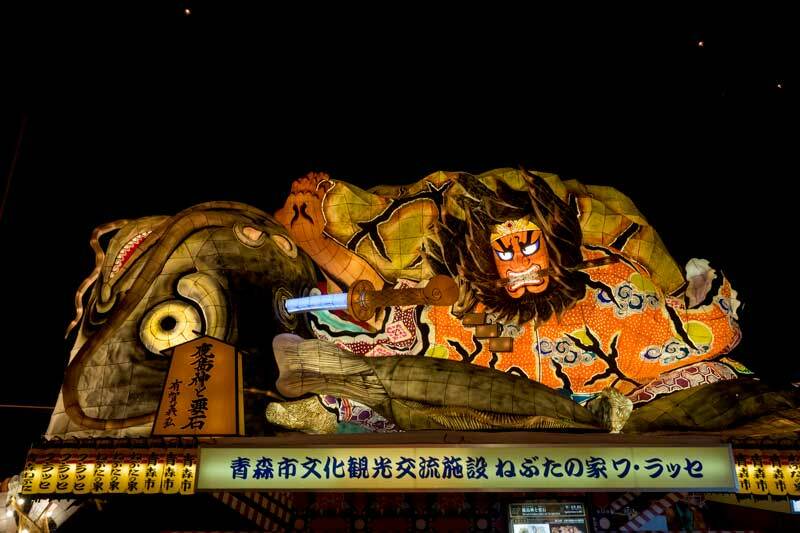 The floats each tell a story of a well-known piece of Japanese history or legend usually involving a warrior. They are thought out, drawn and built with so much detail to communicate the story. For example, this one above appeared in the 2017 parade and is called the maple viewing. It tells the legend of the feudal warrior Koremochi and his soldiers who were out hunting deer when they came across a beautiful woman and her friends out having a maple viewing party. They were invited to join them but the beautiful woman was actually an ogre who tricked Koremochi into drinking a sleeping draught. While he was asleep Hachiman, the God of war appeared to him in his sleep and warned him of the Ogre and presented him with the divine sword. The legend tells how Koremochi went on to use the sword to vanquish the ogre. The floats today have a sturdy wire framework that provides the detailed skeleton of the design then pieces of washi paper are shaped by bending them around each individual section of the frame, they are then cut to size and shape and individually glued in place. Each paper piece is only around 15cm enabling sculpting and features to be formed and then brought to life by expert painting. If you time your visit well you’ll have the opportunity to try your hand at shaping, cutting and adding a piece of paper to a real nebuta within the museum. 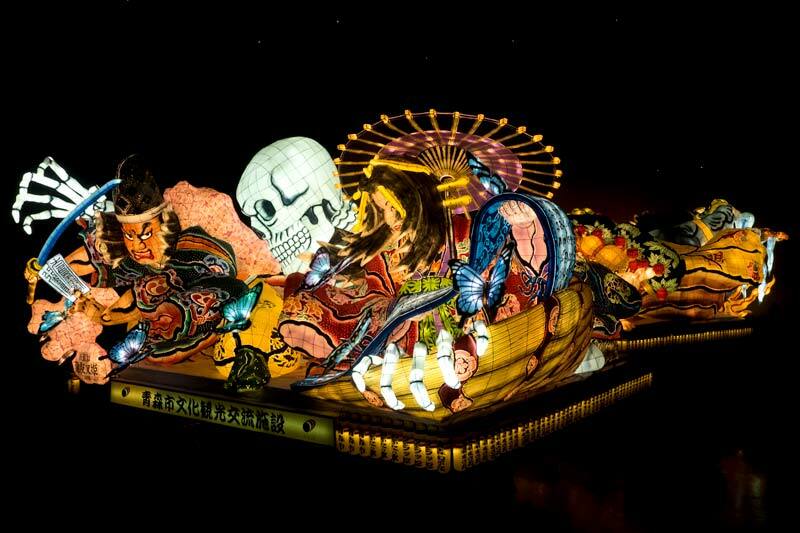 The Aomori Nebuta Festival is one of Japans largest and most colourful festivals and now we have the opportunity to experience some of that drama and fun all through the year. One thing is for sure, that Nebuta chant does stick with you …. RASSERA RASSERA RASSE RASSE RASSERA. If you found this article helpful please consider sharing it on Pinterest or social media with the buttons below. Thank you. Stuff like this; the exact reason why I travel. I’d rent the gear to do it right. Drop 45 smackers and I am set. This reminds me a bit of being in Bali during Nyepi, especially when you attend the parades with demon effigies and all that good stuff. Seeing these floats and figures and all the dances to ward off evil spirits – or to give them their day, so they remain satiated – is incredibly enjoyable. Like nothing I have ever seen in America. Thanks for the rocking share Toni.